The story behind the logo. Many of you have recently received plant material from Edgar Joyce Nursery with nice, shiny new labels featuring the above logo. Some of you have wondered what the heck ‘Way to Go’ means. Well, it’s a simple story, one based in tradition and family values. A story that you don’t easily find these days of large corporate nurseries where the only thing that matters is the bottom line. It’s a story of pride, dedication and integrity. It started back in 1941 with this man, G. Edgar Joyce. From all accounts, Edgar was one heck of a man. A true businessman and a bit of a character wrapped into one. He gave unselfishly to his community and was a huge supporter of local athletics. In 38 years, he did not miss one home or away game of the Bridgeton High football team. He was truly a servant of the community both in his personal community and the nursery community as well. As the story goes, Edgar’s favorite phrase whether it be at the local Little League game or the High School football games was ‘Way to Go’. Whether it was a muffed catch or a homerun, you could always hear a ‘Way to Go’ from the stands. A voice of encouragement resonating above the drone of the crowd. Encouragement for those out on the field, swinging the bats, throwing the TD pass, digging the taxus or loading the trucks. When Greg Joyce, Edgar’s grandson, told me that the logo on his new tag was going to be“Way to Go” I thought that he had said “Way to Grow”. My first reaction was ‘now what the heck does that mean?’ but after an explanation and the telling of his Grandfather’s story, I could have not been more on board with this great slogan. A slogan that both honors a great man but also a slogan that honors a family tradition that is founded on core principles of fairness, integrity, honor and trust. 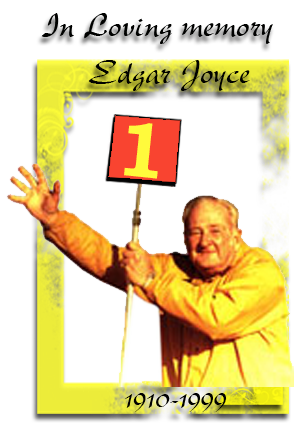 So when you place an order with Edgar Joyce Nursery – Way to Go! You have made the decision to put your trust in a company that will honor your business, provide you with the best quality product and service possible, and will support you in your quest to be profitable. You have put your faith in a company that treats each client equally, will not sell out to the mass merchants and has a value system that honors and appreciates the family business. A company that truly looks at each and every client as a long term partner, not a short term sale. When your customers buy an Edgar Joyce Nursery plant-Way to Go! They too have made the right choice to purchase from a company that puts quality and service before the bottom line. A company that won’t sell to the lowest bidder just for the sake of moving numbers. They are buying material grown by a family that puts their heart and soul into their business and are proud to carry on a tradition that began back in 1941. I have the unique opportunity to work with Greg Joyce and his dad George. I am honored to have this opportunity. So there you have it. A brief explanation behind the slogan on the new tags and a little about the man that was the inspiration behind it.